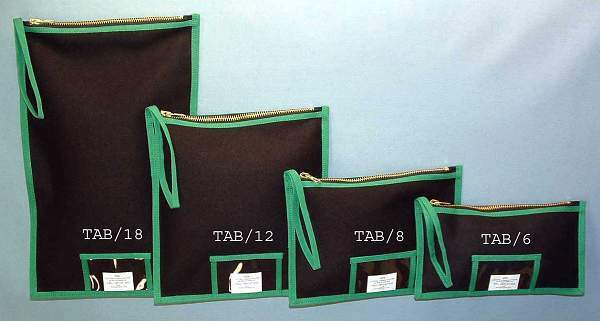 TAB - TAG-A-BAG - These money, bank, coin bags are approximately 12 inches wide. These are my most popular bags by far! The standard features are: heavy duty brass zipper, heavy weight #8 duck construction, clear vinyl window sewn on which holds business card size blank paper tag ( provided ) which slides in and out, and a wrist loop (handle) for securely carrying bag. The height of the stock bags is approximately 6, 8, 12, and 18 inches high. These bags come with what is called a 10-inch zipper. This starts out as 12 inches with one inch of tape (tail) on each end. When the bag is finished this makes the opening approximately 10 inches wide (mouth). We can alter the height of these bags just by asking. The zippers for these stock bags are pre-manufactured but we can use that zipper and make the bag any height you need. We have wider zippers and can put these into this exact style bag, which would make the opening/mouth wider. We can also make that bag to any desired or needed height. These zipper bags have many uses. They are rugged and deigned for everyday use. One of the most popular applications is when an operator has multiple locations or stations where one may pick up money, coins or have pre-set banks made up for different operations. These money bags can easily put an end to the confusion of what bag came from where, or what bag goes where. You can do this by color coding and/or tagging each bag for identification with the removable tag. You can also coordinate and organize your operation by matching bags and aprons by colors using the vast choice of color options for a much smoother operation. The stock bags come with a very heavy-duty zipper and you can also have the choice of having a locking zipper installed on any size bag as an option. This locking zipper is also brass and allows you to put a small padlock on the slider body of the zipper which keeps zipper pull/tongue down, which in turn locks the bag with a small metal tooth when it is in this down position. Simple but effective. These bags are cetainly not limited as money, bank and coin bags. Our bags have as many uses as the limit of your imagination. The color combinations are almost endless. You can have a solid color bag such as black with black trim or a black bag with any one of my multiple color trims. Of course you can mix and match all the others fabric colors with the trims colors giving you a wide array of color choices. These bags like my aprons can be altered to any size you need to tailor fit your operation. We would also be glad to design a bag or pouch to hold anything you need to put into it from bills, documents, tickets, tokens to tools or whatever you choose.